**Yes, I know this is in Iowa, but it’s easily something that someone in Nebraska could do. Today the family took a day trip to Mount Crescent Ski Area in Crescent, Iowa. Dave and I can now proudly add this small mountain to our “I didn’t realize there was skiing there!” locations that includes Mad River Mountain, Ohio, Mountain Creek (formerly Vernon Valley), New Jersey, and several resorts in South Korea. First off, realize that this is the first time Dave and I have skied since we’d had kids. We skied almost annually every year we were dating/were married from 1994-2002. I was about 12 weeks along with Jacob when Dave and I took our AFIT graduation trip to Lake Tahoe in March 2002. Dave and I like to think we’re decent-enough skiers. So combine the fact we hadn’t skied since 2002 with our never having to pay for more than just a pair of lift tickets for Dave and me. That being said, we were met with the shell shock of the price tag for a family of 4 to ski, rent equipment for the kids, and get 90 minutes of semi-private lessons for the boys — with one of the kids skiing for free at age 4: over $200! Phew. Plus lunch at the slopes, and dinner on the way home. Our checkbooks were still in shock from Disneyworld! What’s really sad is that Mount Crescent is probably one of the least expensive ski opportunities there is! I looked at all the other ski mountains Dave and I had been to that might have cost the same, and they cost more! So if we’re going to make this a routine family outing, I’d better up my AF Reserve work! Dave had to wait about 45 minutes just to get our lift tickets, and we got quite annoyed. I was imagining the minutes ticking away from our day. It turned out the computer system was down and the attendants were having to manually calculate our bills. Thankfully the credit card machine was working! The boys didn’t have their lesson till about 2 hours after we started skiing, so Dave and I worked with the boys some on little fundamentals. The boys seemed cooperative, and after about 45 minutes of letting the boys ski down to us, then pushing or pulling them back up the hill, we convinced them to take the lift up to the top of a green run. Timmy had a blast — he just pointed his skis down and went. Stopping was an issue (which the lessons helped with immensely), but he was having a ton of fun. Jacob, on the other hand…not so good. He took his first spill about 20 feet from the end of the lift and was in tears after that. We had to explain very carefully to Jacob that the only way down the hill was for him to simply go, and that we had arranged a lesson for him later on and we REALLY hoped he’d be cooperative for the lesson. It was slow going, but he made it with a lot of help! He calmed down with a snack and a chance to warm up in the lodge before his lesson. Both boys had a fabulous time with their lesson and their confidence was well-boosted, and we spent another 2 hours skiing and had so much fun. Dave and I would take turns with each of the boys…with Timmy, we could ski at speed and still not keep up with Speedy Gonzales, but with Jacob, while he’s a champ at the snowplow, he’s VERY CAREFUL. I would just snowplow with him, giving more pain to my already-anguished thighs from last night’s plyo workout. NOTE: The boys didn’t keep the poles for long. After about an hour both boys relinquished them for the rest of the day. 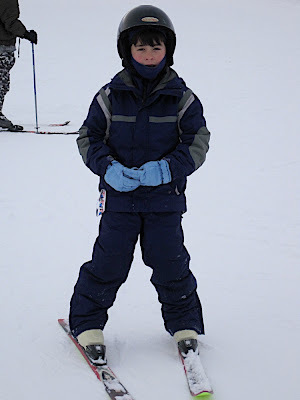 In summary, we had a great time and both boys would enjoy more ski trips. This is a tiny little ski area, but definitely a great place for the boys to establish confidence. The ski conditions were exceptional, since it was about 10-15 degrees F most of our time there, with snow flurries most of the afternoon. None of that softened snow freezing into ice sheets at sunset like Dave and I typically experience in the northeast! In other news, as I’d mentioned before, Dave and I hadn’t skied since March 2002, meaning our equipment hadn’t been used since March 2002. While our skis, bindings and poles — albeit out-of-ski-fashion — worked well, my boots each developed visible cracks in the plastic when I put them on. They didn’t seem mission-terminating, so I used them today, but I’ll definitely need to start looking for new boots soon. I’d also like to keep an eye out for second-hand equipment for the boys. If anyone knows of any good sources, let me know!